Email Blast #8 1/2: New Purchases: Since I am no longer doing print fairs, all new items will be offered first in this fashion. No one knows what they new items are until the day of upload and all people on our email list get an equal shot at the new prints. Upload will always be at 1pm Eastern Time on the designated day so East and West coasts can have an equal chance. These blasts are what will happen when I compile a critical mass of new items. I will be sending these out a number of times per year. This is in lieu of yearly catalogs and will give all on my mailing list a more or less equal shot at new items. **IF YOU ARE NOT ON MY EMAIL LIST YOU CAN SIGN UP AT THE BOTTOM OF THIS PAGE (**We never share, sell or otherwise expose your email address). Some of my photos tend to be a bit dark or yellowish due to problems witht the white balance on my camera. You can jump to artist's last name by using the alphabet, below. Also, you can search for a given name (e.g. "Benton"), item (e.g. "elephant"), location, etc. by using the "Find" function on your web browser. 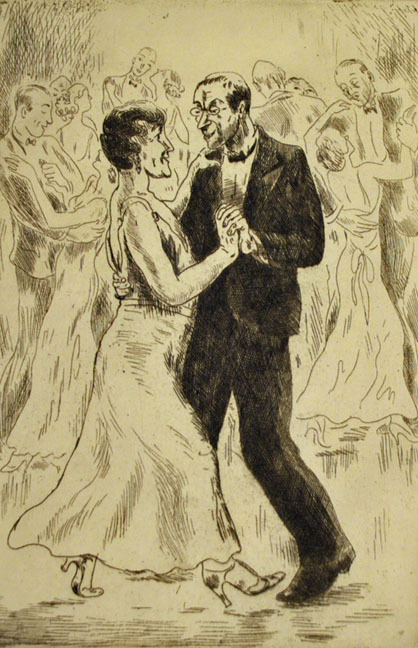 PC users: Control + F and Mac users: Command + F.
"MAD ABOUT DANCING," etching, 1933, F116, ed. likely small, 6 x 3 7/8.” Signed in pencil. SOLD. Other impressions of this print are in the collections of the Whitney Museum, and the Wichita Art Museum, I find no auction sales of dealer offerings of this image going back over 25 year so I imagine the edition was quite small. The woman dancing is Julianna R. Force a museum director and administrator who was director of the then new Whitney Museum of Art in 1930. 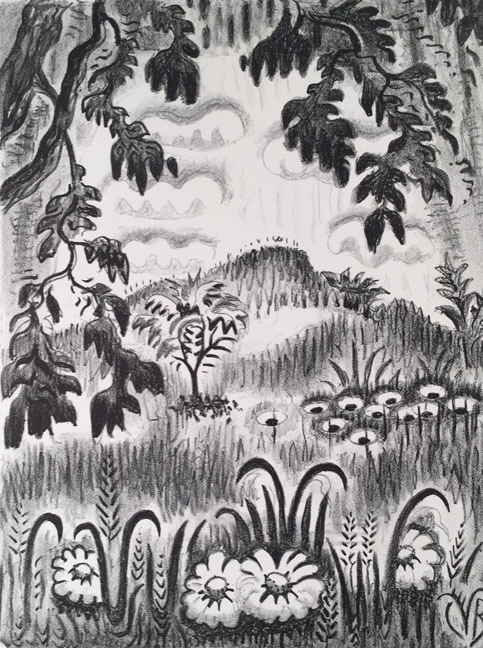 "SUMMER BENEDICTION," lithograph, 1953, P193, ed. 260, 11 7/8 x 9 1/8.” Signed in pencil. SOLD. Full margins; slight skinning upper margin edge verso well out of image area. A publication of the Print Club of Cleveland. 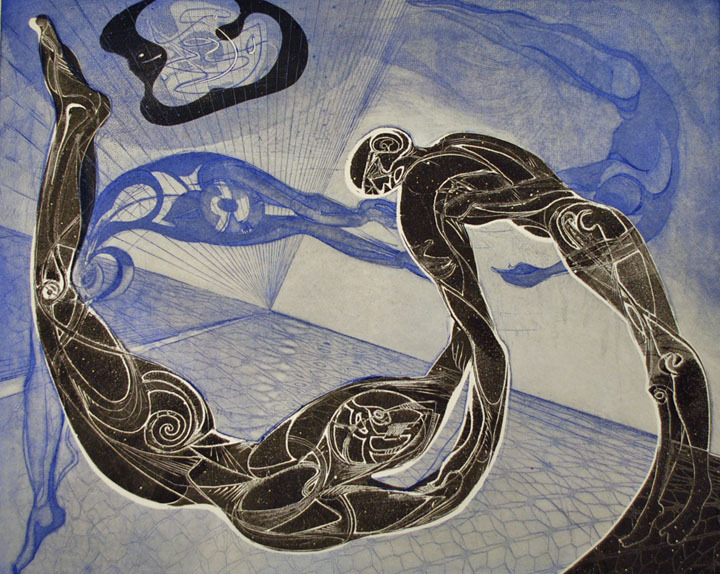 "AERIALISTS" (Blue), color etching. engraving & aquatint, 1949, ed. 50*, 13 1/2 x 16 5/8.” Signed in pencil. SOLD. *This is a trial proof (#3) outside the edition of 50. It appears identical to other impressions of the editioned print. 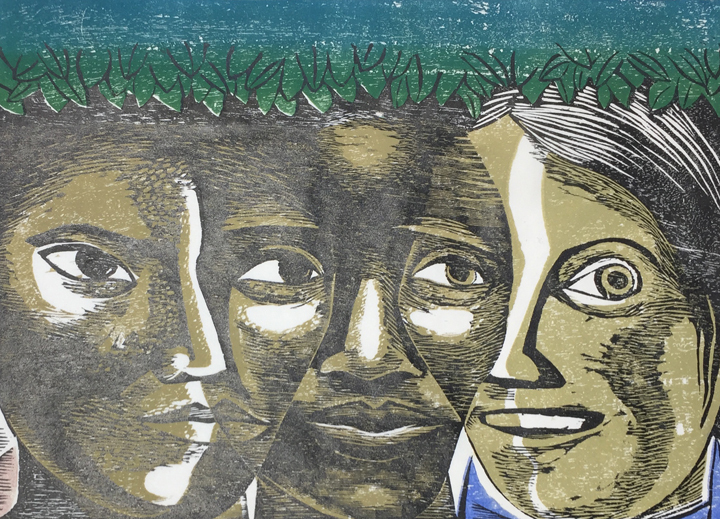 "WOMEN OF AMERICA"*, color woodcut, 1963, ed. 40, 9 1/2 x 12 3/4.” Signed in pencil. SOLD. 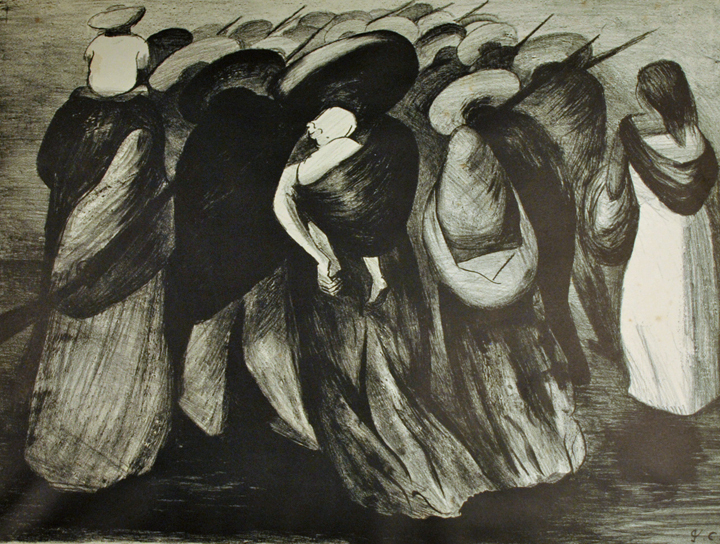 *“Unidad de la Mjuer Americana” The print is illustrated in Samella Lewis' The Art of Elizabeth Catlett, p. 119. Uncommon. 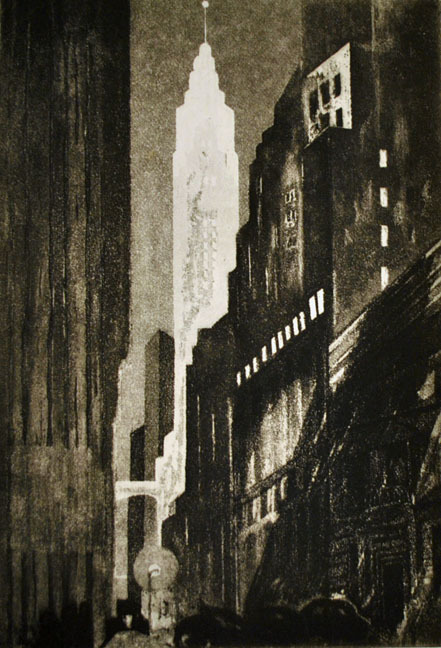 "NOCTURNE" ("NY--60 Wall St."), aquatint, c. 1939, ed. 50, 8 x 5 3/8.” Signed in pencil. SOLD. With label from the Seventeenth Exhibition of American Prints, Philadelphia Art Alliance, 1939. 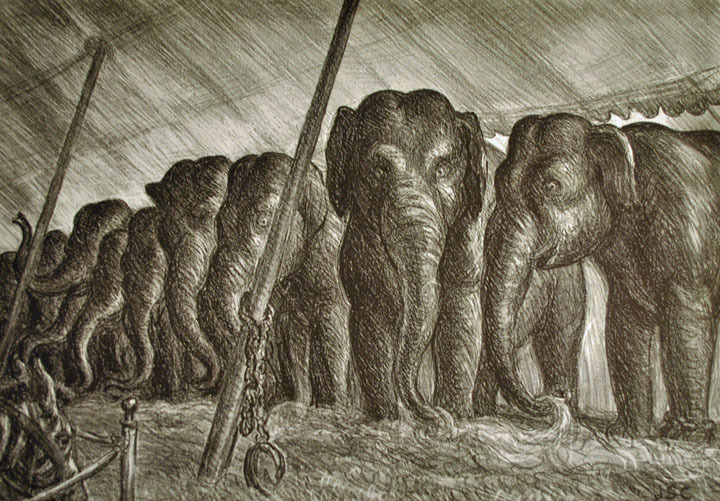 "CIRCUS ELEPHANTS," lithograph, 1936, ed. 50, 9 3/8 x 12 3/8.” Signed in pencil. SOLD. 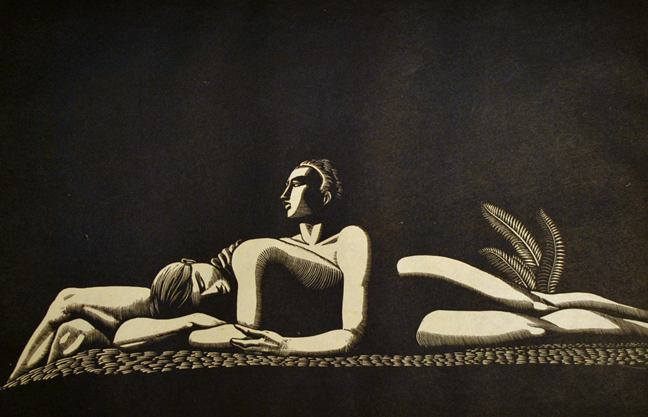 "RHAPSODY IN BLACK," woodcut, 1931, ed. 50, 8 x 10.” Signed in pencil. $4750. Titled in pencil and also inscribed “New York 1931.” Typed label reads “Honorable Mention, Philadelphia Print Club, 1943.” Inking slightly light, lower image. An impression was shown in the Print Makers Society of California in 1932. 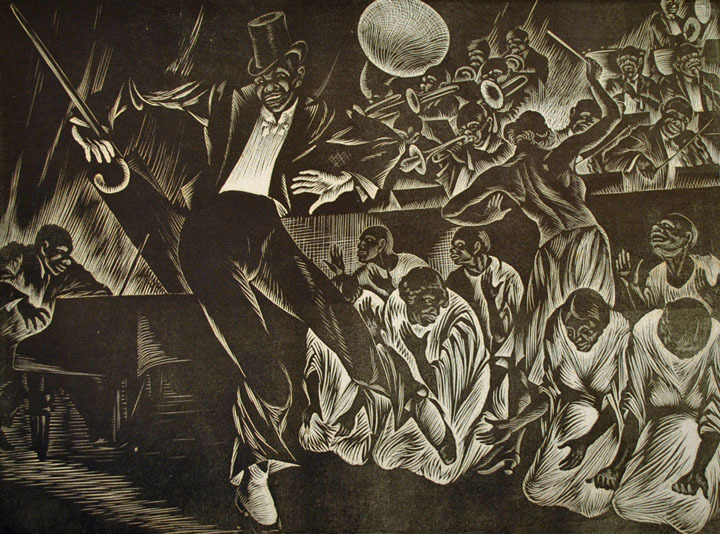 "THE DEBUT,", lithograph, c. 1935-40, ed. 25, 5 x 7.” Signed in pencil. $175. Know also as Beatrice Beard. Member of the National Association of Women Artists; studied at the National Academy of Design and with Gutzon Borglum. Know primarily for her illustration work and medical illustration. Wrote and illustrated the children’s book Broad Stripes and Bright Stars (1941). There is a portrait bust of the artist from 1934 by Isamu Noguchi in the Wadsworth Atheneum. 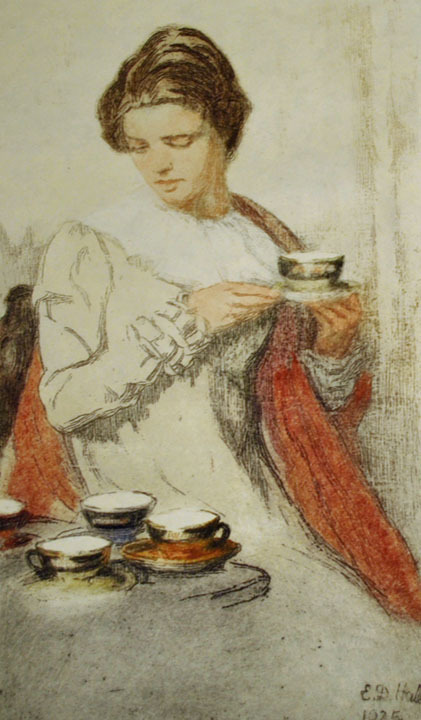 With a blind stamp on the sheet of Old Queens Gallery, New Brunswick, N.J.
“THE HARLEQUIN TEACUPS,", color etching & aquatint, 1925, ed. likely small, 10 x 8.” Signed in pencil. SOLD. 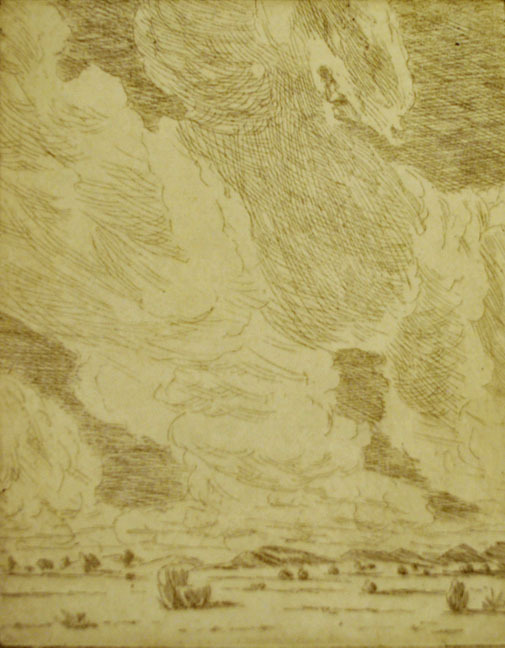 Another impression of this print was exhibited at the Chicago Society of Etchers exhibit in 1926. 2 pinholes for registration in the right and left center plate mark. Titled on the reverse and noted “No. 11.” Uncommon. 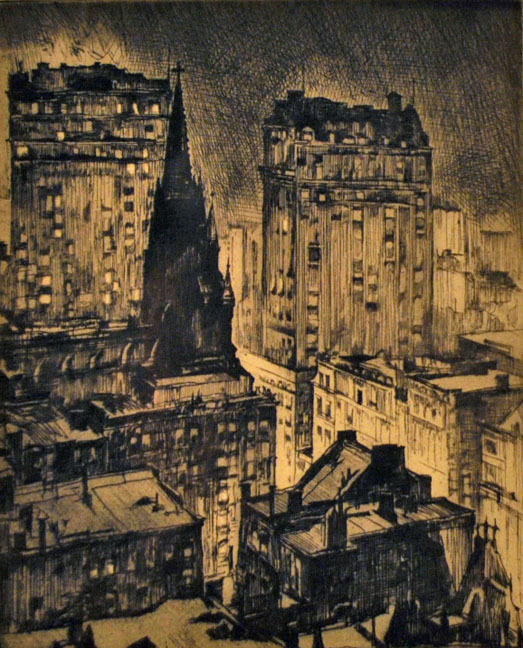 “UPPER FIFTH AVENUE, NIGHT," etching, 1919, 5 7/8 x 4 3/4.” Signed in pencil. SOLD. Uncommon. Narrow margins, even toning. Framed. With label from Frederick Keppel & Co., NY. 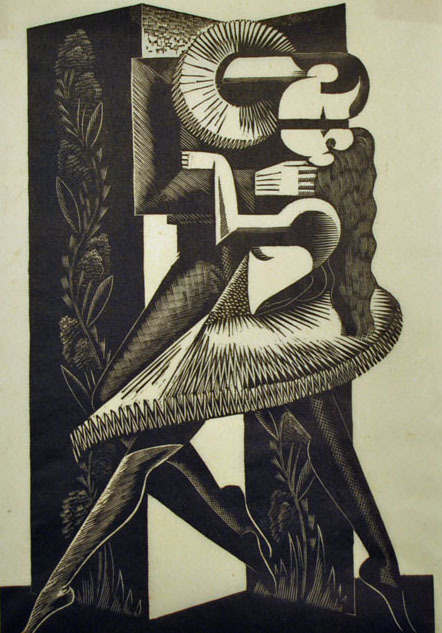 “THE LOVERS,” wood engraving, 1928, BJ23, ed. 100, 6 1/2 x 9 3/4.” Signed in pencil. SOLD. 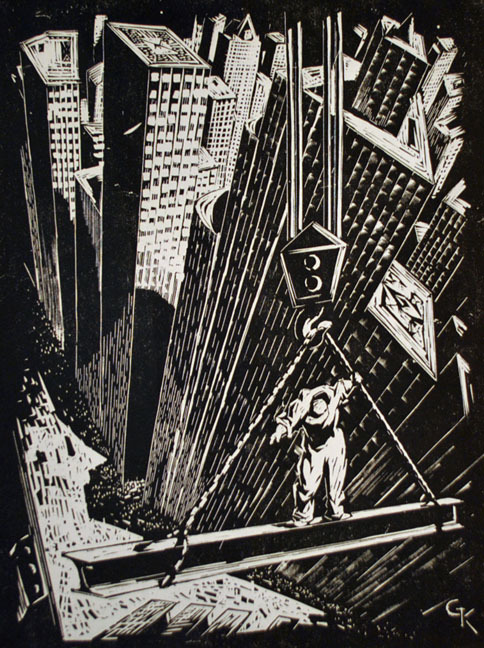 “NEW YORK CITY" (Man Riding Girder), wood engraving, 1928, 8 1/8 x 6.” Signed in pencil. SOLD. 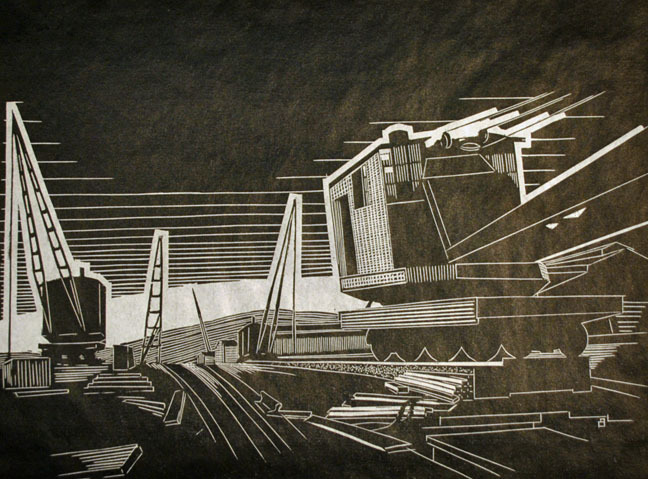 Kolski was a great print maker who lived a very short life. He was a frequent contributor to the Masses and was quite political. He died by jumping off the new George Washington bridge in a protest over unemployment. I saw an image of this once, I think in the New Masses, and it was titled “Proletarian Sport.” Kolski is an often-overlooked artist who created an extraordinary body of work in his short lifetime. I own about 30 of his works and hope to compile a catalog of his work some day. Would be interested in hearing about other works by him in all media. 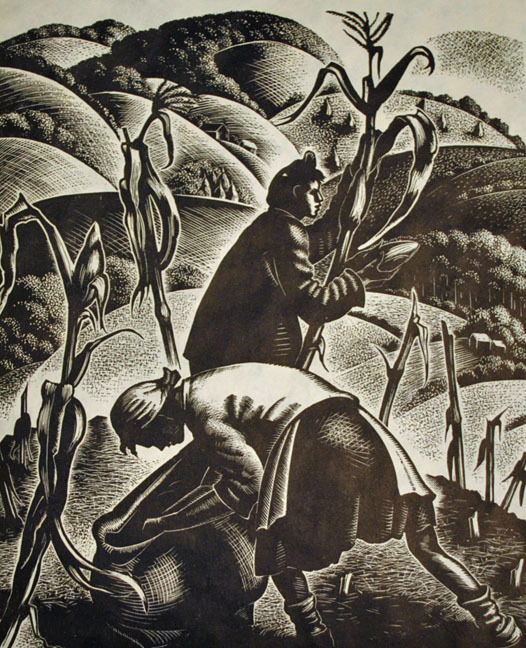 “PULLING CORN,” wood engraving, 1952, B641, ed. 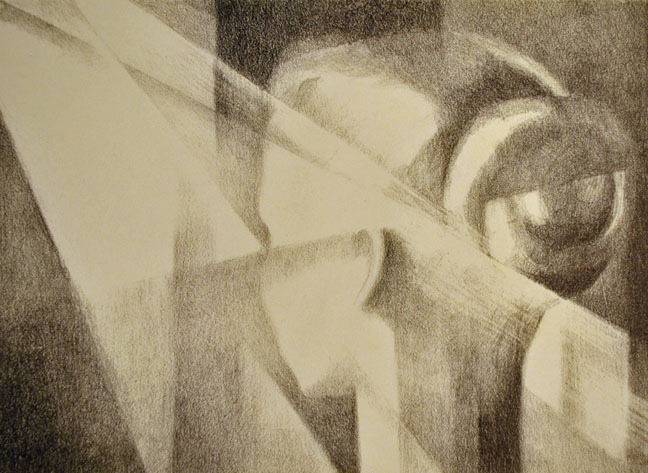 c. 100, 6 1/2 x 5 1/2.” Signed in pencil. $525. Old hinge remnants top corners. 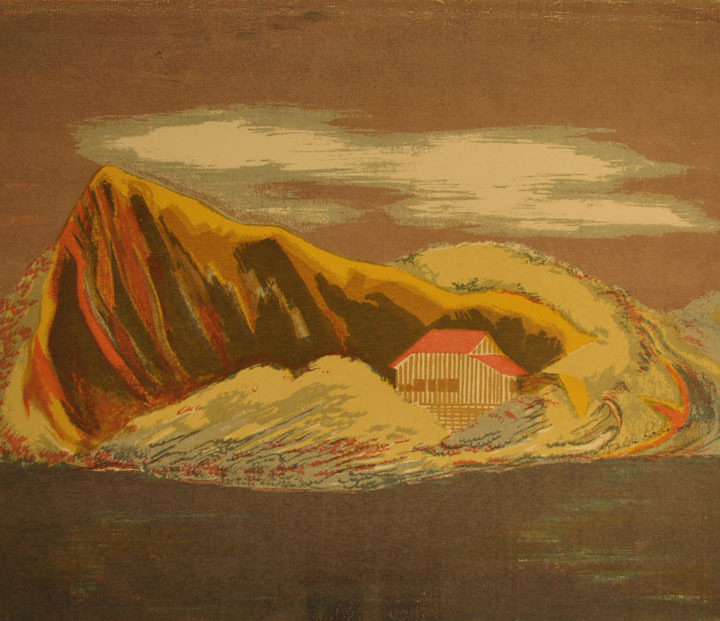 “THE RUNAWAY," color linocut, c. 1915, 14 1/4 x 11.”” Signed in pencil. SOLD. 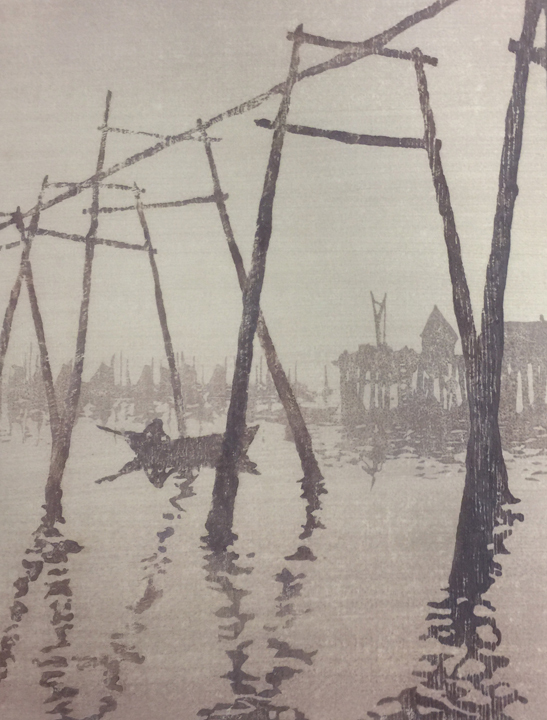 This is a variation on the image titled “Low Tide” and pictured (Catalog #28) in Janet Flint’s landmark exhibit of 1983, Provincetown Printers: A Woodcut Tradition. 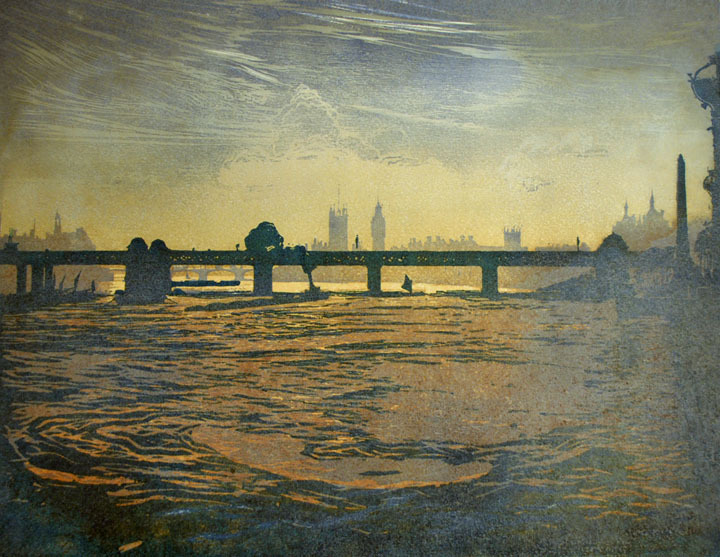 (”Low Tide”is the same image but has no buildings printed). "REAR GUARD," lithograph, 1929, H18, ed. 100, 13 3/4 x 18 5/8.” Signed in pencil. SOLD. “HOLIDAY TIME (Mary),” color woodcut, 1921, MBL59, ed. 50,10 1/4 x 12 3/8.” Signed in pencil. SOLD. Uncommon. Framed. 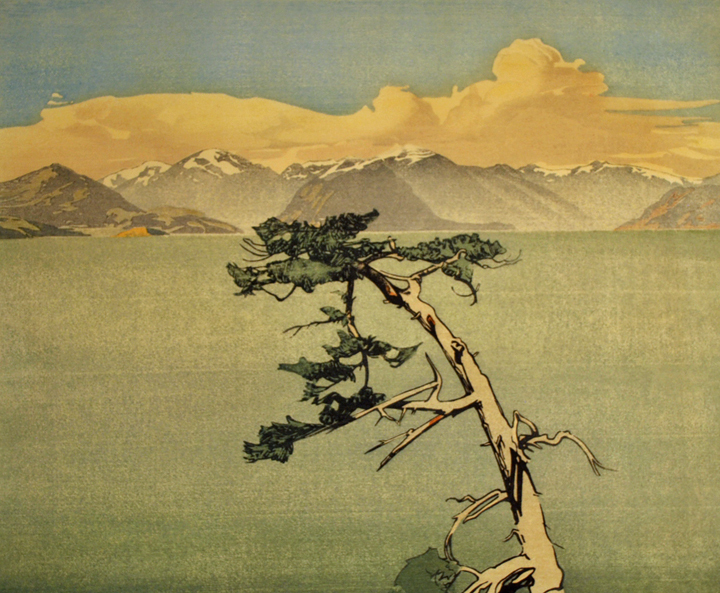 “HOWE SOUND, BRITISH COLUMBIA,” color woodcut, 1935, ed. 100, 10 1/4 x 12 3/8.” Signed in pencil. $5250. 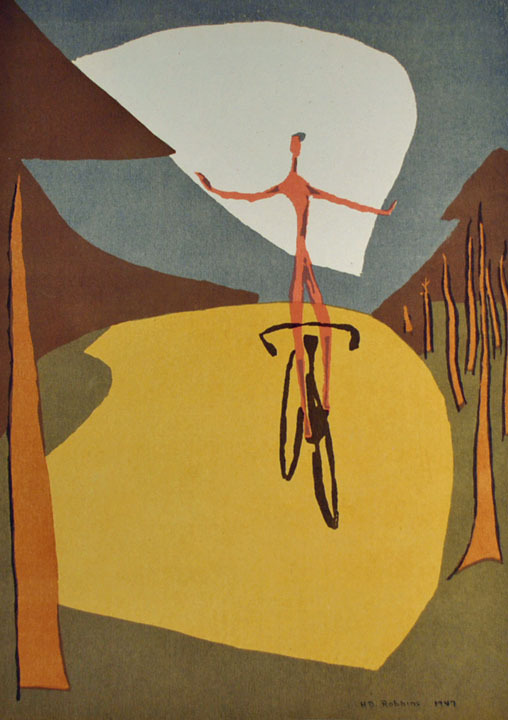 This image has particularly wonderful colors..
“BOY ON A WHEEL," color screenprint, 1947, ed. 45, 14 1/4 x 10 1/4.” Signed in pencil. $495. Robbins created a series of quirky screenprints in the 1940’s. According to the artist’s inscription ("Co5"), 5 screens were used in printing this image. Has never beenpreviously framed nor matted. “QUARRY ON THE RIVER, MERCER COUNTY," color screenprint, 1942, ed. 45, 12 x 14 1/4.” Signed in pencil. $425. Robbins created a series of quirky screenprints in the 1940’s .According to the artist’s inscription ("Co12"), 12 screens were used in printing this image. Has never been previously framed nor matted. 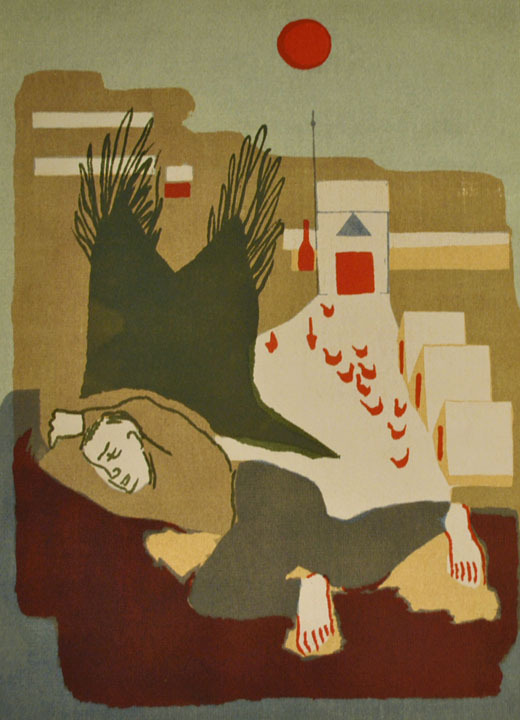 “THE DREAMER," color screenprint, 1947, ed. 35, 14 x 10.” Signed in pencil. $495. Robbins created a series of quirky screenprints in the 1940’s. According to the artist’s inscription ("Co6"), 6 screens were used in printing this image. Has never beenpreviously framed nor matted. 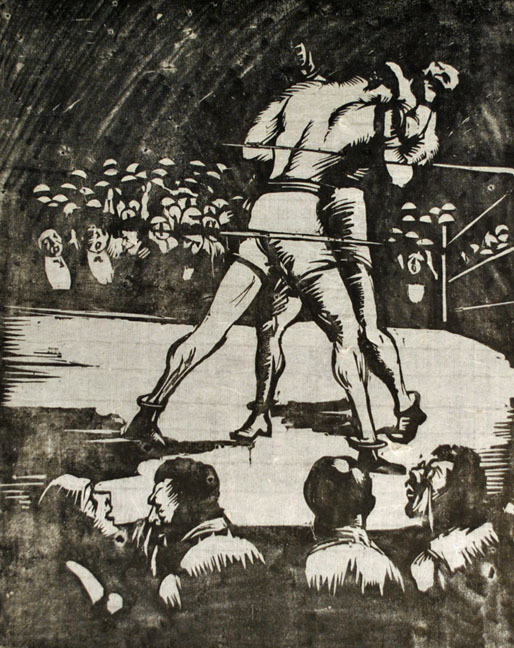 "PARIS" (Boxers), woodcut, 1926, 12 3/4 x 10 1/2.” Signed in pencil. SOLD. Inscribed in margin, “Paris, 1926,” An uncommon image by the artist. PORTRAIT OF A PARTLY-DRAPED MODEL WITH ARMS FOLDED, lithograph, 1937, ed. very small, 9 3/4 x 9 7/8.” Signed in pencil. $1950. Rare. Not in Cole. 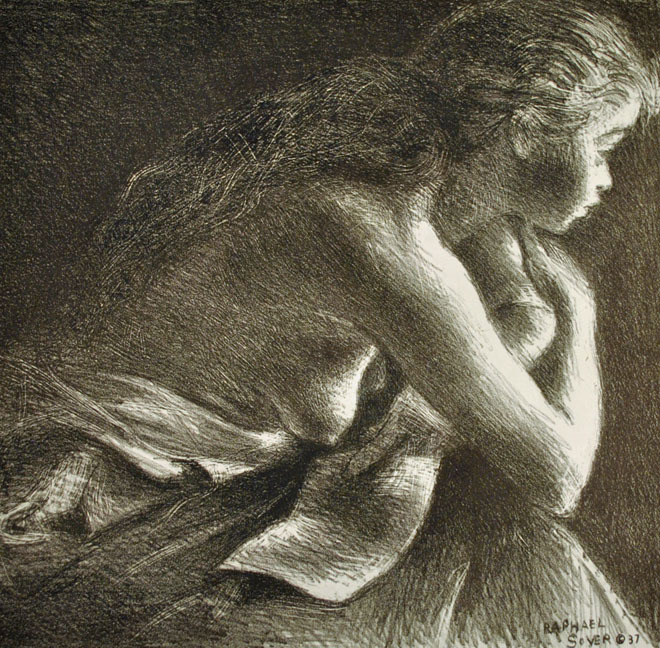 From an earlier listing of this image by Ed Pollak: "This print has a very strong relationship to Toward the Light,' Cole 35, which Cole and Gettings date to It shows the same model, in the same drapery, though here with her hair down, facing the same light (here the window is not shown, but the light is shown on the model's face and arms). Soyer, quoted by Gettings, claims there was no preparatory drawing for 'towards the light,' that it was done directly on the stone, yet it seems obvious that the two works were done at the same time." 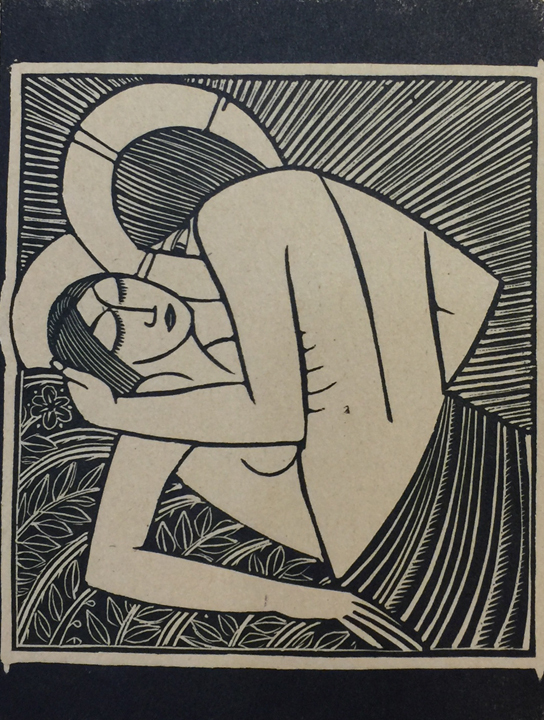 “THE KISS," linocut, 1932, ed. 100, 8 3/4 x 4 3/4.” Signed in pencil. SOLD. Thin spots upper margin corners, out of image. 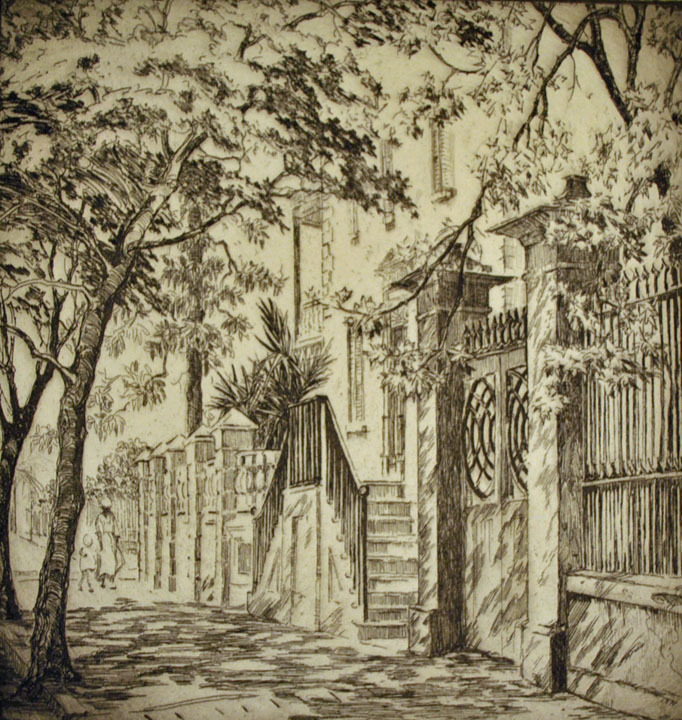 “SHADOWED WALLS, CHARLESTON", etching, ed. 80,5 3/4 x 5 1/2.” Signed in pencil. SOLD. 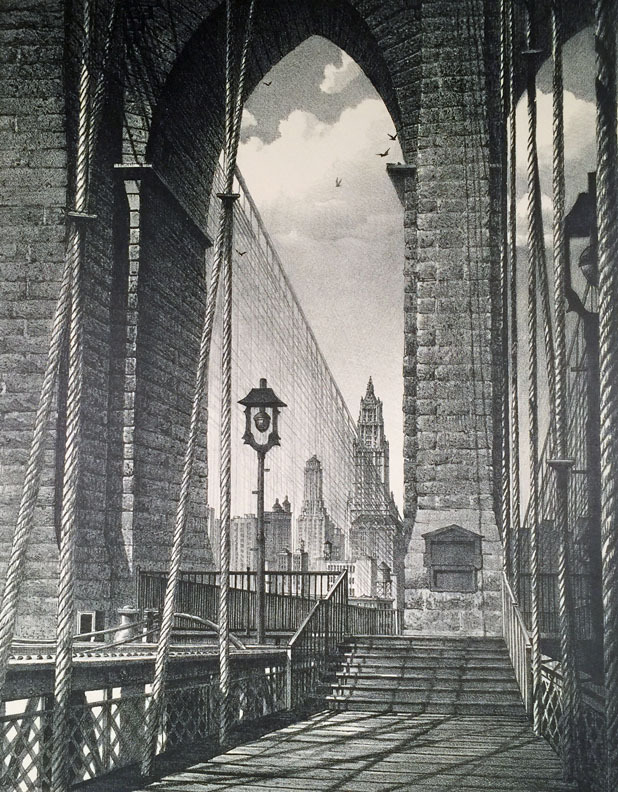 “HIGH ARCHES, BROOKLYN BRIDGE", lithograph, 1960, S260, ed. 50, 14 5/8 x 11 1/2.” Signed in pencil. SOLD. Although an edition of 50, this image is not commonly seen. Large (full?) margins. Hinge stains upper corners, verso. Titled in pencil lower margin edge and numbered 24. 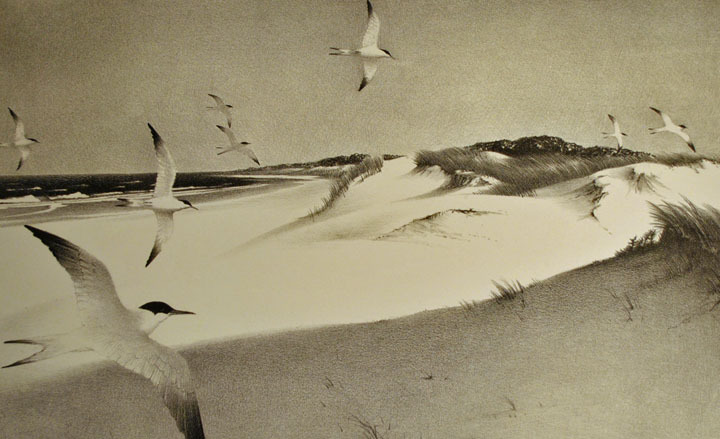 “SUMMER FLIGHT," (Ogunquit, Maine), lithograph, 1954, S216, ed. 35, 9 1/2 x 15 1/2.” Signed in pencil. $300. A scene in Ogunquit in January of 1954. DESERT SCENE, etching, 4 1/4 x 3 7/8.” Signed in pencil. $150. The artist was active in Texas. All Rights Reserved. Copyright 2019 Steven Thomas, Inc.